U.S. figure skater Adam Rippon stole the show on Monday at the Winter Olympics in Pyeongchang, South Korea. The outspoken athlete delivered a "spellbinding" performance in the team event, according to NBC commentator and former Olympian Johnny Weir, and he made history by becoming the first openly gay athlete from the U.S. to medal in the Winter Games. 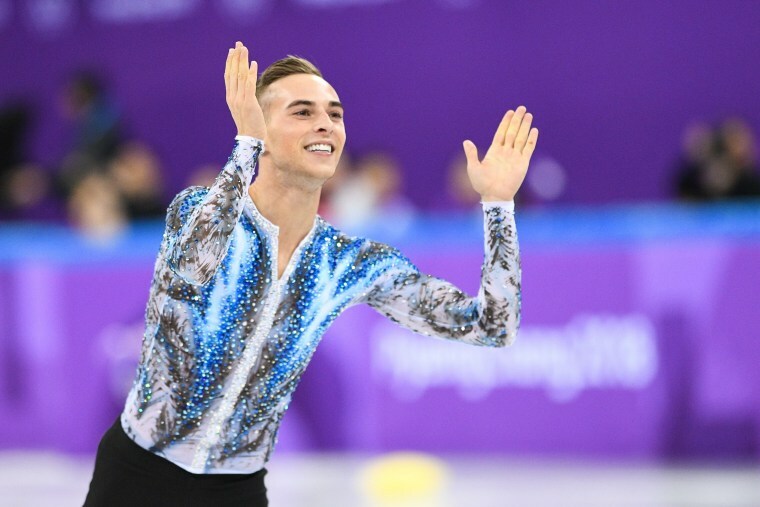 After dazzling the judges with his bronze medal-winning performance, choreographed to Coldplay and executed in a shimmering costume (a signature of Rippon's), the veteran skater opened up about scoring his first Olympic win. "It felt worth the 28-year wait, you know?" Rippon said. "I was sitting backstage and I thought: 'You know what? I still feel like I might throw up. And I might miss every element in my program.' But I said: 'You know what? I trained so hard and I know when I get out there I'm going to go for everything, take one element at a time,' and I was able to do that." Rippon, who was perhaps previously best known for clashing with Vice President Mike Pence on LGBTQ rights, trended worldwide on social media and quickly became the darling of the Winter Games. He even got a shoutout from actress Reese Witherspoon, whom Rippon claimed he wanted to make proud before his first Olympic competition. Rippon's history with Pence, of course, was not overlooked. If Adam Rippon wins a medal, Mike Pence has to personally bake a gay wedding cake. Sorry, those are just the rules. But it was Rippon's charm that won the internet over. His penchant for saying a reporters' names before speaking with them (in one case, "Andrea") delighted viewers, as did a joke about needing a drink and a Xanax. Eager to congratulate Rippon was fellow gay Olympian Gus Kenworthy, a U.S. freestyle skier whose budding friendship with Rippon has excited fans of the duo. Kenworthy's first shot at an Olympic medal with be on Saturday, Feb. 17, in local time (Sunday in the U.S.). Ashland Johnson, director of public education and research for national LGBTQ advocacy group Human Rights Campaign, called Rippon's performance "a proud moment for our entire country and especially meaningful for LGBTQ Americans." Rippon was not the only gay athlete to make history. Ireen Wust, a speed skater from the Netherlands, was the first out athlete to medal at the Pyeongchang Games, according to Outsports, and Canadian Eric Radford became the first openly gay man to win gold at the Winter Olympics after his performance with partner Meagan Duhamel in the team figure skating event. "This is amazing!" Radford tweeted after being told of his history-making feat. "I literally feel like I might explode with pride." Radford and Rippon posed together with their medals after the event, with Radford writing, "So proud to be wearing these medals and showing the world what we can do! #Represent." Along with Kenworthy, waiting to compete is U.S. speed skater and former world champion Brittany Bowe. Bowe, the only out woman competing for the U.S. in Pyeongchang, snapped a pic with Kenworthy and Rippon shortly after the opening ceremony. For all the latest Olympics news, schedules and results, visit NBCOlympics.com.